For a change of pace we’re eating something a bit un-all-american. We’re eating my personal take on the Thai dish Larb. The dish was made with browned ground turkey simmered with chopped mushrooms, onions, carrots, red peppers, panang curry paste, chile fish sauce, and rice wine vinegar. After the meat simmered it was tossed with fresh diced jicama, tomatoes, and green onions. The larb is served with whole leaves of napa cabbage to eat it on and cilantro for a garnish. T: this was fun and tasty. I enjoyed scooping the goods onto the lettuce and eating it that way. I understand why that method of eating is all the rage these days. A: these days? i’m pretty sure this method has been around for quite some time. it is fun though! and mega tasty…. and easy! woo hoo! T: it just seems like it’s gotten more popular lately, especially with the low carb craze. I gotta say, though, as tasty and fun as it was, I needed some additional carbs when it was all over. T: we only had like 4 cheezits left if you’ll recall. Thank god for old dry bread. mmmm… actually, the bread was pretty good once I scooped this meaty concoction onto it. That stuff was goood. 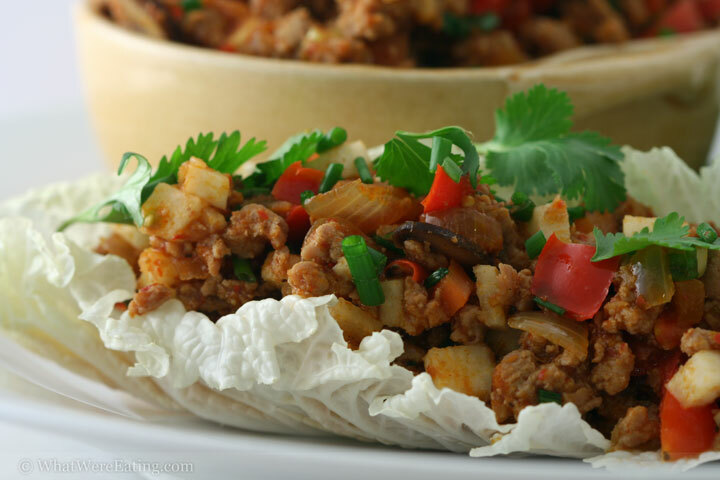 A: kind of like the thai version of sloppy joes! only it’s on cabbage. i really dug it too. this is something the chef made at harvest, a restaurant that used to exist in baton rouge, when i was working there and i remember liking it. then i forgot about it! funny how that happens. he mentioned it to me a few months ago and since then i’ve been meaning to give it a whirl. T: I’m glad you did. It’s always fun when a meal is eaten in an unusual vehicle. T: you must have another life that I don’t know about cuz I’ve never seen you on a moped or a trike. And that’s good because I would be afraid of you wrecking and dying a horrible death. A: you’ve got a point there. anyway, it is fun to use things other than the standard utensils for eating. and cabbage rocks the hiz-ouse. T: Do you have anything to mention about the meaty concoction that went on the cabbage? A: other than what was mentioned in the intro text? T: ok, i’ll take that as a no. well, I rate this one a 4.49/5. It was tasty, and had a lovely vessel on which to travel to my mouth. It was a plus, too, that it was turkey. That means I can allow myself to eat some kind of quadruple cheeseburger for lunch tomorrow w/out feeling too bad. What’s your rating? A: heheh um, i’m not sure that’s how the whole eating something healthier works, fyi. T: sure it is. i’ll take one step forward and 2 steps back instead of just taking 2 steps back. That’s something to feel good about. A: true dat! okay, i’m going to rate this meal a 4.55/5. it was really tasty. maybe not for those who can’t handle a bit of sodium though. between the canned panang curry paste and the chile fish sauce, it’s definitely well-seasoned without having to add any salt. the ease of this meal is appealing to me too. it might not be a meal you can bust out in thirty minutes but there is nothing challenging or too time consuming. i think the cabbage, jicama, and tomatoes really helped “lighten-up” the flavors and the cilantro added a freshness. overall, i am totally game for eating this again. T: me too. now beer me! Preheat a large pan over high heat. Once the pan is hot, add the canola oil. Swirl the canola oil around the pan to coat. Add the ground turkey to the hot pan. Brown the turkey. Once the turkey has browned, remove from the pan, leaving the drippings. Reduce the heat to medium and add the onions, carrots, and red peppers. Saute the veggies over medium heat, stirring occasionally, until the onions are translucent and the carrots are soft, about 10 minutes. Add the garlic and ginger to the pan, stir, and cook for another minute. Add the browned turkey, curry paste, fish sauce, water, rice wine vinegar, and brown sugar to the pan. Stir to dissolve all ingredients. Bring ingredients to a boil, then reduce heat to low and simmer, stirring occasionally, until all the liquid has cooked away, about 20 minutes. Turn the heat beneath the pan off. Add the diced, tomatoes, jicama, and green onions. Stir to combine. Pour the turkey mixture into a serving dish. Garnish with cilantro leaves and fresh chives. Serve with napa cabbage leaves for the eating vessel. Enjoy! *My apologies to anyone who may be offended at this unauthentic take on larb! Like a Thai version of Sloppy Joe’s… now, that’s a great image. I’ve made Asian lettuce wraps with shrimp and noodles, but I haven’t made it with any meat like this. I’ll have to give ita try, especially as it almost scored a perfect 5. I just like to say larb. May the Larb be with you. ohyeah, those look fantastic. amanda , you are solely responsible for bringing ground turkey into my life. we had turkey burgers last night and they were deeeelish!!! Wow! I never tried turkey larb. But that sound amazing. I definitely need to try it with my left-over. Chicken and beef larb are great. But thanks for the suggestion. It will be great!